Almost half the world’s population cooks with highly polluting, traditional biomass stoves that burn wood or crop residue. The resulting household air pollution is one of the world’s leading causes of death and contributes significantly to climate change. Currently in my third year in the Applied Animal Biology program at the University of British Columbia, I have always wanted to expand my horizons by spending time overseas. I learned about the Mitacs Globalink Research Award through a program advisor and decided to apply. This research award provides travel and accommodation funding for undergraduate and graduate students to conduct research outside of Canada. I am a PhD candidate in the Environmental Applied Science and Management program at Ryerson University. I am interested in approaches that will help software developers design products that meet customers' needs, require less energy to produce, are longer lasting, and can be safely and responsibly disposed. I am studying the interrelationships between product quality and sustainability and I’m enthusiastic about finding and removing their boundaries so that software developers aren't afraid to be more sustainable. Most previous studies of spin in real galaxies were done in 2-D, so Dr. McCall’s study has changed the discussion of galaxy spins in the astrophysics community. This spin organization is at odds with established theories of spin alignment in our “neighbourhood of galaxies”. Understanding spin alignment provides insight into how this neighbourhood emerged and evolved. The temperature was 46 degrees for almost the entire first two weeks here, and I’m quite sure to have lost ten pounds in that time. Luckily, Hanoi is one of the great street food capitals of the world, where you can get a tasty bowl of Bún chả famous to the city, with freshly grilled meats in it for $1 or $2 and gain back any of that lost summer weight. It’s been a whirlwind of new experiences since I arrived in Vietnam two months ago. I am here to study seahorses, both underwater and those that are caught by fishing boats. It’s the field portion of my MSc degree, which I am completing at the University of British Columbia Fisheries Centre, co-supervised by Drs. Amanda Vincent and Sarah Foster. My lab, Project Seahorse, conducts research all over the world, with a focus on Southeast Asia. My work is strengthening ties between Canada and Vietnam, and helps work towards greater conservation for seahorses. Alberto Solis Serrano, from Mexico’s Universidad Autónoma de Nuevo León is the recipient of the Mitacs Undergraduate Award for Outstanding Innovation for his research at the University of Alberta in summer 2015 under supervison of Professor Patricio Mendez in the Department of Chemical and Materials Engineering. Watch Alberto's acceptance speech below. 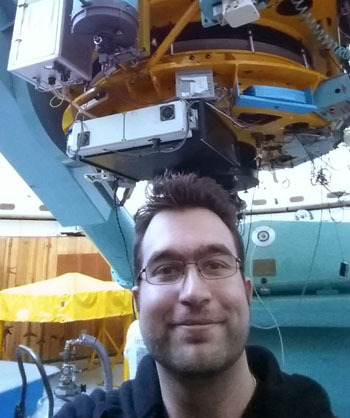 George Conidis, a PhD student in the Department of Physics and Astronomy at York University is the recipient of the Mitacs PhD Award for Outstanding Innovation for his research at Universidad Nacional Autónoma de México with Dr. Michael Richer through a Mitacs Globalink Research Award. Sequential photography is best described as multiple photographic images arranged in sequences that explore the medium’s relationships to movement, memory, or narrative over an extended period of time. As part of my research, I spent three months in Paris, France, with support from the Mitacs Globalink Research Award.